More than an Island is city history at its very best. 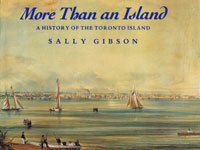 Note only does Sally Gibson vividly depict the social, economic, political and natural history of the Toronto Island, she also illuminates the history of the city as a whole. A work of impeccable and thorough scholarship, it teems with life. A marvellous book about a marvellous place. This is social history with heart, political vision, lively wit, and, above all, the touching immediacy of vanished lives. The posh and the downtrodden are here, the women and babies, the captains of industry, the sweated labourer and the dashing firefighters. A particular charm of this book is the amplitude of the photo captions, packed with juicy details and political-historical commentary rooted in the concrete evidence offered up by these shapshots of our past. An interview between restoration architect Martha Werenfels and author Sally Gibson tells more about Inside Toronto: American Institute of Architects (AIA) Preservation Architect. 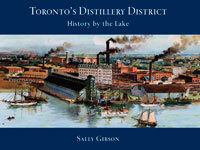 Toronto's Distillery District: History by the Lake, 2008, Toronto: Distillery Historic District, 173 pages, 200 illustrations won a 2009 Heritage Toronto award of merit. The first and only book about this remarkable site has been described by Toronto's most popular morning radio host and indefatigable advocate of Toronto, CBC's Andy Barrie, as "a gorgeous book" deserving wide readership. Listen to the June 2008 interview here. And read what the Ontario Heritage Connection had to say about it. 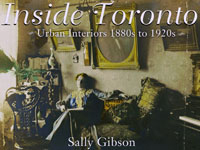 To purchase a specially autographied copy of Inside Toronto: Urban Interiors 1880s to 1920s and/or Toronto's Distillery District: History by the Lake, please indicate your mailing address on this contact form and pay for your purchase using this PayPal form. As soon as payment is confirmed, your book(s) will be sent by Canada Post. Copyright © 2009 Sally Gibson All rights reserved. No reproduction without prior consent.